The Indian Ringneck Parakeet has been referred to as the "Noble Parakeet"! The species, Psittacula krameri, is also called the Rose-ringed Parakeet and contains four subspecies. Â Â The Indian Ringneck Parakeets have been held in admiration and esteem since ancient times. They are a large parakeet, sought after for the superiority in their form and beauty, their ability to speak, their intelligence and trainability, and because they are easy to breed. ThIs parakeet, the Indian Ringneck Parakeet, has been a long time favorite for bird lovers! There are many color combinations that can be produced, which is a fun challenge and fascination for many breeders! Check out the More Photos for really cool examples of the different colored ringneck parakeets. Distribution: The Rose-ringed Parakeet, which includes the Indian Ringneck and the African Ringneck subspecies, is the most widely scattered member of the race of parrots and is spread throughout Asia and parts of Africa. They are found in India, China, Ceylon, Africa, Tibet, Nepal and many adjacent islands. The Indian Ringneck Parakeet originated in Ceylon. The African Ringneck Parakeet, its close cousin, is found from west Africa to the Southern Sudan. Description: Indian Ringneck Parakeets, along with their close cousin the African Ringneck Parakeets, Psittacula krameri krameri, belong in the Psittacula genus that are known as Ringneck Parakeets. The species, Psittacula krameri, is also called the Rose-ringed Parakeet and contains four subspecies. The Psittacula genus has the distinguishing characteristic of a colored collar going around the head in the males, or a pronounced stripe running through the chin area. The normal coloration of the male Indian Ringneck Parakeet is a general green with its lower abdomen area being lighter and the back of the head has a bluish tint. A black ring that runs thought the chin and along the cheek. There it blends into a pink collar with some blue on the nape. The central tail feathers are bluish, tipped with a yellow green, and the outer tail feathers are green. The upper mandible of the beak is a red-orange and the lower mandible is black. Through domestic breeding, there is a large variety of color variations, or mutations available. The female and immature male has no black ring, pink collar, or blue tint on the back of the head. Juveniles also have a coral pink beak with a pale tip. The young reach their adult plumage after their second full molt, at about 3 years of age. These birds grow to a length of 16" (40 cm). The African Ringneck Parakeet is very similar in coloration to the Indian Ringneck but the facial coloring and the rose collar is less prominent on the African males. They also have a smaller beak, with the upper mandible being a dark red becoming almost black on the tip. Though the African Ringneck has a smaller, shorter body than the Indian Ringneck they have a longer tail, so overall they reach up to a length of 17" (43.5 cm). In the wild, Indian Ringneck Parakeets eat a variety of seeds, berries, fruits, nuts, blossoms, and nectar. In addition to these foods, you can offer them vegetables and commercial pellets. They also enjoy the same nutritional foods humans eat, including cooked chicken. Cooked beans, rice, and grains are also enjoyed, but soft foods like these will spoil in about 4 hours. An occasional millet spray is a nice treat. Housing: A a roomy cage is required as these are large parakeets. Social Behaviors: In the wild, these birds live in flocks and are very social. They have a pleasant nature but will develop a screaming habit if teased. Handling/Training: The Indian Ringneck Parakeet is smart! Besides learning to talk, these parakeets are known to be great at learning tricks. Some have been taught to string beads on a rope, twirl sticks about their head, ring a bell, and pick up selected objects. Unlike many parakeets, Ringneck Parakeets do not bond with a mate for life, but they are easily bred. Each pair will need two nesting boxes to choose from. Once the nest box is selected the female will lay two to six eggs. The incubation time is between 22 and 24 days and the young will leave the nest about six to seven weeks after they hatch. Potential Problems: These parakeets can have a loud scream. 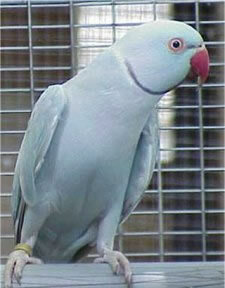 Availability: Indian Ringneck Parakeets are available at pet stores or from breeders at reasonable prices. They can be obtained in a variety of color mutations, including the Indian Ringneck Lutino. Hello I noticed your post that you have an Indian Ringneck that's been visiting your bird table I'm curious as to where you live and if you say Florida is the bird green? I have a blue one and hes so amazing and every morning I wake up he starts to say good morning. I want ringneck parakeet(blue). Where will i get & what is its cost?